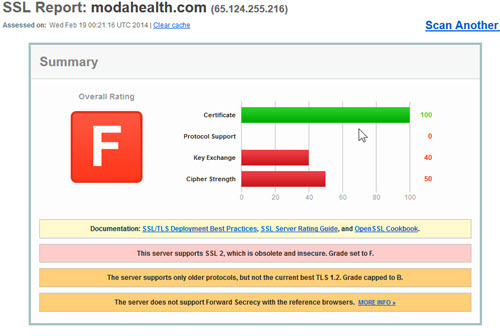 Here is a copy of an email I sent to Moda Health regarding the security of my medical information and online account. Only short insecure passwords are accepted. This probably means you are storing the passwords instead of hashing them. This is terrible. You are still supporting SSL2 - This should not be supported. You support weak cipher suites. The bottom 3 will allow a man in the middle to compromise an SSL connection. You can run the SSL tests yourself and get feedback on how to mitigate at: https://ssllabs.com "
This doesn't seem unusual. I had similar results checking out Kaiser and Providence as well as every doctor's portal I tested. However, every bank I've tested, as well as Amazon and Google do things properly. Here's an overview picture from ssllabs from a report on February 18, 2014.